There's plenty you can do before calling for a tow. OK, so you’re done fishing and you turn to the outboard engine and give the key a turn. Ominously, you don’t hear a thing. Or, she turns over but as soon as you give it forward propulsion, she stalls. No one is going home soon. Before you call for a tow, here are some tips. Gone are the days of smacking the old 2-stoke with a ballpeen hammer and she starts up with a cough and puff. These new engines are nearly as complex as car engines have become – and they are plenty complex! I would be willing to wager that the largest source of boats not getting underway is lack of fuel. This is really not something you should let happen. Use the “1/3rd-1/3rd-1/3rd” Rule. Plan on using a 1/3rd of your fuel to get there, a 1/3rd to get home and 1/3rd in reserve for the unpredictable events plus the predictable headwinds. How do you know how much fuel that is? Well, the least reliable device on your boat, in my measured opinion, is your fuel gauge. This is why I have been constantly recommending to skippers that they keep records of their fuel consumption – engine time when you started, engine time when you refueled, calculate gallons/hour consumed. And write it in a log. 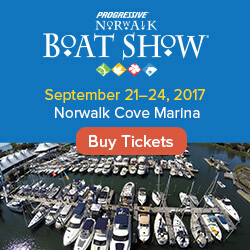 I have been since day-1 on every boat I’ve ever owned. It is also a good indication if there is something that needs addressing when fuel consumption stops being predictable, i.e., you’re using more than you should be by historical standards (see Atlantic Maritime, We All Get Heavier with Age – And so do our Boats!) I really don’t recommend storing fuel in cans aboard as a back-up. It just seems so much smarter and so much safer to keep and use your log. 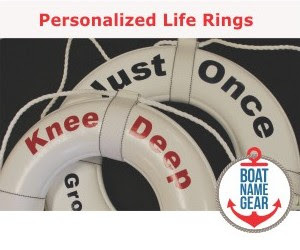 If the engine stalls or you feel a real “drag” when you get underway, stop and do some quick checking. You may have plenty of gas (see above) but if the primer bulb is contracted, there is a blockage somewhere causing a vacuum – which can be as simple at the fuel vent being covered, blocked or actually manually shut. Check that. If the bulb is easy to squeeze but doesn’t get hard when doing so, this can also be a real problem. It may be as simple as leak somewhere that is allowing air into the system or as serious as a pinhole in the line and gas is leaking into your boat. Use your nose – asap! And don’t forget to check the fuel filter for fouling. You have a spare filter aboard, right? 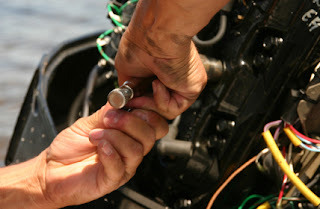 If the overheating alarm goes on, stop the boat, turn off the engine and get the cover off. Wait for the engine to cool down. If you can turn the key and the alarm hasn’t started, the engine has cooled – and now the detective work begins. First, start the engine and see if the tell-tale water stream is still spritzing out. If not, or only partially, stop the engine. See if you can get something sturdy (60-pound monofilament?) into the tell-tale and clear it out. Even better, often the tell-tale is integrated into the water plug that you remove to give the engine a water flushing. Take the plug out and then ream that monofilament into the tell-tale so you just don’t push the blocking material back into the engine. If no water is still coming out of the tell-tale, tilt the engine up and check the intakes. They could easily be blocked with seaweed. If the intakes are clear and the tell-tale is also clear, it is one of two problems. One, the impeller is compromised and that isn’t likely to get fixed at sea. The other is that the sensor itself is faulty. This happened to me once when I was delivering a 2-engine vessel. We were 10 miles out and the overheating warning came on re one of the engines. I had to respect the over-heating signal so I proceeded on one screw until we were within hailing distance of the dock. I fired up the second engine, which still registered as being over-heating after 30 minutes of cooling down (which made me think that it WAS the sensor) and laid her up against the dock in under 60 seconds. Repairs, which meant just replacing the sensor, were quickly affected.